Plus, sampling traditional molé ice cream. John Birdsall Molé ice cream at Fruitvale's Nieves Cinco de Mayo. Berkeley is slated to get an artisan butcher shop later this year, one that'll trot out a variety of sustainably raised whole beasts. The Local Butcher Shop hopes to launch in early September, in the old Red Hanger Kleaners on Cedar and Shattuck, just behind Crepevine, facing the parking lot of the Andronico's on North Shattuck. The proprietors: current Chez Panisse cook and Oliveto alum Aaron Rocchino and his wife, Monica, an account exec at Emeryville's Paula LeDuc Fine Catering. The Rocchinos acquired the 1,100-square-foot North Berkeley space last fall, and spent months lining up permits. The build-out began early last week, but don't expect The Local to look like butcher shops you've known. Instead of the traditional cooler case showing off chops and trimmed loins, the Rocchinos plan to display larger cuts from whole animals, and cut all meats to order. "We want there to be an interaction between butcher and customer," Monica Rocchino told What the Fork. "Our main goal is to educate and build trust." That means not scaring anybody. "For a lot of home cooks, walking in and seeing a huge spread of meat can be overwhelming." Pork, beef, lamb, chickens, ducks, rabbit, eggs — all animals will come from ranches and farms within a 150 miles of Berkeley, raised in what Rocchino called "an iconic sustainable way," pastured, and grass-fed in the case of grazing animals. Quality (and price) should be akin to that at Marin Sun Farms' counter in Rockridge or the Cafe Rouge meat market on Fourth Street but with whiffs of interactivity, like the San Francisco shops Avedano's and Fatted Calf. Other Local offerings: house-made stocks, demi-glace, and rendered fats, plus a daily sandwich. As for giving the meat counter at Andronico's a bit of unprecedented competition at a time when the local chain is struggling, well, uh — sorry, guys. "Thus far the neighborhood has been really welcoming," Rocchino said, "but so far we've been super undercover." Then again, will the boutiquey-ness of the meats make them affordable only to Berkeley hill dwellers, double-parking their Audis for a consultation about the best cut of beef for braising? Not necessarily. Monica Rocchino: "Because we'll be buying whole animals, we're paying one price — it's the distributors who put an arbitrary value on cuts. We don't want to be so expensive that nobody can afford to shop here." Plans call for highlighting less familiar (read: cheaper) cuts, offered with recipes from Aaron Rocchino that should ease customers' fears of the unknown. "He's a damn fine cook," his wife said. Fruitvale's most traditional ice cream maker has started churning what has to be the East Bay's least conventional flavor: molé. 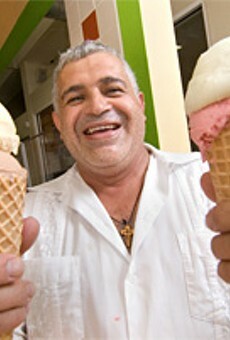 Back in 2007, the Express discovered Fruitvale frozen dessert maker Luis Abundis, the only guy in the Bay Area we know who's turning out nieves de garrafa , ices made the way they were before the rise of the crank freezer, which is to say completely by hand. Abundis has a smile only slightly less impressive than his upper-body strength. Standing at his garrafa — a metal canister wedged inside a wooden bucket filled with ice and salt — he turns out multiple batches of ices every day, beating house-made mixes with a hand-held paddle till they freeze. Turns out we weren't Abundis' only fan. For a couple of years now, Lito Saldaña — chef and owner of Cocina Poblana — has been sourcing vanilla ice cream from Nieves Cinco de Mayo, offering it at both his Jack London Square and Emeryville restaurants with a house-made churro, cajeta, and a Mexican chocolate reduction. Saldaña and Abundis have a connection that runs deeper than mutual admiration — both men grew up in the same region of Jalisco, outside Guadalajara, albeit in separate towns. So when Saldaña sat down to devise the expanded dessert menu he launched this week, his first idea? Appeal to Abundis to provide an expanded range of flavors, including one tailored specifically for Cocina Poblana. "Since we specialize in molés, we thought it would be nice to see what he could do," said Saldaña. He gave Abundis batches of the restaurant's three red molés. Abundis ended up blending them for the ice cream he eventually came up with, a pale, peach-colored confection made with milk, but — like all of Abundis' ices — no egg. The flavor's gentler than you'd think. There's warmth from the spices, chile that registers more as sweetness than heat, and just a flicker of onion and garlic — it all works together, thanks to the naturally stripped-down texture of Abundis' ice milks, and his tendency not to oversweeten. Check out the molé ice cream (paired with fried sweet potato chips) at either of Cocina Poblana's locations (1320 65th St. in Emeryville and 499 Embarcadero West in Oakland). Abundis started selling scoops at Nieves Cinco de Mayo, both the original in the Fruitvale Public Market (3340 E. 12th St.) and the offshoot (3448 International Blvd.). 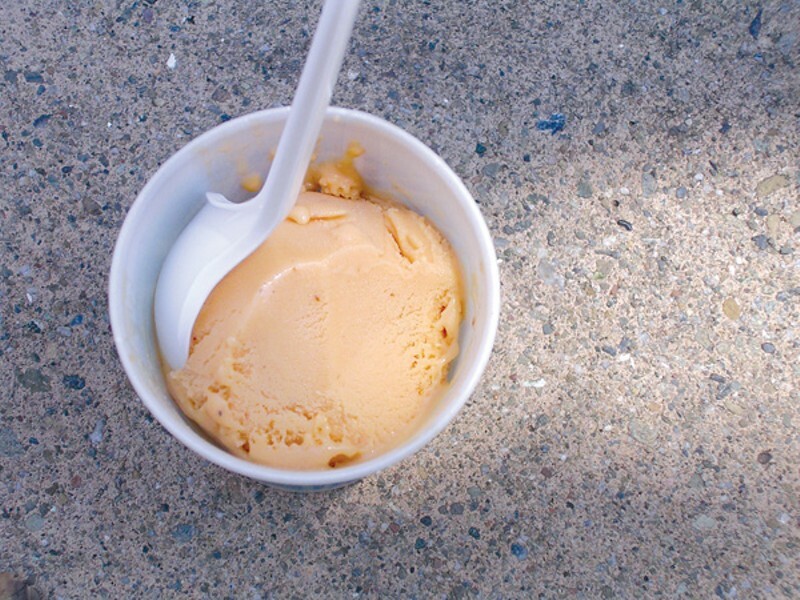 Sweetness infuses the Oakland neighborhood, where a buck will buy you a delicious hand-churned ice cream.